contain the distillate of massive sampling and data recording exercises. Through the efforts of many volunteers, species were recorded in selected areas throughout the UK and the results compared with data from previous surveys in order to calculate ‘change indices’ for different types of plant / habitat. Such indices allow botanists to examine how the frequency / distribution of a species has changed (whilst allowing for differences in the way in which the recording has been done at different times etc). The results are often presented in terms of changes in broad habitats (such as broadleaved woodland, chalky grassland, wetlands, built-up areas and gardens etc) and/or by plant type – natives, archaeophytes and neophytes. Native species, archaeophytes and neophytes. Natives, as the names suggests, are plants that arrived here after the last Ice Age by natural colonisation.Examples range from tree species such as birches (Betula pendula) and oaks (Quercus robur & petraea) to white clover (Trifolium repens) and dandelions (Taraxacum sp). Archaeophytes are ‘ancient introductions’, plants that were introduced (accidentally or deliberately) by humans before 1500 AD. 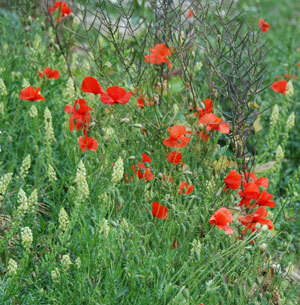 Ancient introductions are plants like poppies (Papaver sp), which often came in with crop seeds, whilst other species might have been introduced for medicinal or other uses. Many are now are now thought of as part of our flora, such as the Sweet Chestnut. Neophytes are plants introduced since AD 1500. They include all the plants brought back from various parts of the world by plant collectors /gardeners, which have escaped from gardens or were planted in the wild and then spread. Examples of Neophytes range from Michaelmas Daisies (Aster sp) to the infamous Japanese knotweed (Fallopia japonica). Whilst native species overall show little change, those in certain areas or habitats such as chalky or acid grasslands have not fared so well – due in part to habitat loss. Archaeophytes, however, have fared even worse. Many of these are or were associated with arable land and farming – which have seen massive changes in practice in recent times (increasing size of field, loss of hedgerows, greater cereal production coupled with increased use of fertilisers and weed-killers, loss of ‘traditional’ crop rotations etc). Neophytes represent nearly half of the species discussed in the New Atlas survey and the data record the spread of many of these recently introduced species. 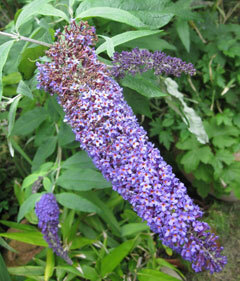 Some like, Buddleia davidii, the butterfly bush, are quite popular additions whereas the New Zealand pigmyweed (Crassula helmsii), which grows in a range of aquatic habitats, is next to impossible to eliminate once established. However, thinking in terms of broad habitat – what about woodlands and woodland species? Well, woodlands have changed quite considerably in the 40 or 50 years after the Second World War. During that period, there was a loss of broadleaved woodland to agriculture, urban growth, roads and motorways and to coniferous plantations. Management practices such as coppicing or clear felling became less common, so that the density and shade increased in many woods. As the trees grew up and the shade increased, glades and rides became overgrown - as coppicing and management of woodlands declined. During this same period, there was the loss of many elms (Dutch elm disease) and the severe droughts in 1975/6 affected many southern woodlands. Damage by animals, such as deer which have increased in number, has not been without effect. In more recent times (from the late eighties to present day), the loss of broad leaved woodland seems to have slowed down. This is supported by the CEH countryside survey that suggests that there has been an increase in broadleaved woodland throughout the 1990s and many new hedges have been planted (many hedgerows were lost in the 50's, 60's and 70's. 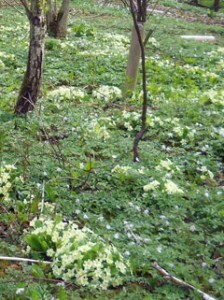 The storms of 1987 and 1990 temporarily reversed the increased shading in some woodlands and lead to an increase in the ground flora. 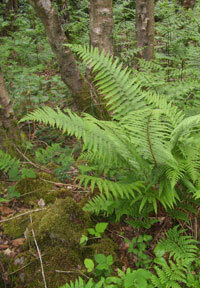 Overall, the flora of such woodlands has changed relatively little, though some species have prospered in the increased shade such as the broad buckler fern, whilst species less tolerant of shade have declined somewhat. Changes in the flora of woodlands is perhaps less than in other places as most woodlands represent a climax community (a stable natural community) so they tend to change slowly; also ancient woodlands are now protected by conservation measures. National survey of common plants or the wildflower count. Plantlife is currently running a major national survey The Common Plants survey or the Wildflowers Count which is looking for volunteers. This is a long-term project that monitors changes in particular, but ‘easy to identify’ wild flowers - such as the primrose - that are also indicative of certain habitats. Volunteers are asked to look for these some 99 different species in randomly selected 1km squares close to where they live OR "undertake a 1km walk in a given area taking note of any of the wildflowers in the Wildflowers Count ID guide (and the type of habitats) along the way". If you are interested, you can contact Plantlife here or read about the project by downloading a pdf file here . We have noticed that since we started coppicing, cutting bracken and otherwise managing our wood there has been a big increase in flowers like primrose, foxglove and a number of otheres. This year we found some Goldilocks buttercup in a coppiced area where it had not been seen before cutting the trees.